"Red Hiding Hood" is a story from the national touring production "Act!vated Heroes" (currently touring). This page is for teachers to use to extend the learning experience after your school assembly. Relevant core curriculm and national arts standards listed by grade level. 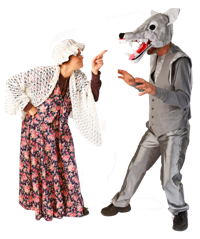 As Red Riding Hood is skipping along with a basket of cookies for her grandmother, she bumps into a Woodsman. He warns her to watch out for a bad wolf and gives her a whistle to blow in case of an emergency. If he hears it he promises to come running. Red continues on her way, encountering a bunch of forest animals dancing and playing (played by students from your school). They are frightened away by the Wolf. But the Wolf convinces Red that he is not a bad wolf. Red tells him she is on her way to her grandmother's house. The Wolf talks Red into getting some flowers to bring to her grandmother. While she is picking flowers the Wolf gets to Granny's house, seizes her and puts her in the closet. However, while the Wolf is putting on his disguise, Granny manages to escape and run away to safety. When Red arrives, the Wolf pretends to be her grandmother. After delivering the classic "What big ears you have. What big eyes you have. What a big nose you have. What big teeth you have." lines; Red discovers the truth and blows the 911 whistle. By the time the Woodsman arrives, his heroic services are no longer needed as Red has managed to defeat the Wolf through her own resourcefulness. It turns out the Wolf does not like whistles. She's been called by many names, including Little Red Cap, Blanchette, and Little Golden Hood. But she's best known as Little Red Riding Hood, so that's the name we give her. Her story, familiar all over the world, apparently started many centuries ago in Asia: there's a Chinese equivalent called Grand Aunt Tiger, and another one called Lin Po Po or Lon Po Po (Forest Grandmother). In some of the older versions, the girl is stalked by an ogre or demon or other supernatural being. But sometime during the Middle Ages, after the tale made its way to Europe, the bad guy became a wolf. Which isn't surprising, since rural folk have always had a certain dread of wolves. Wolves kill livestock and a few rabid specimens have been known to attack humans. And word got around, even before Twitter, so wolves ended up with a bad rap they mostly didn't deserve – you can see it in such stories as The Boy Who Cried Wolf, The Three Little Pigs, and Peter and the Wolf. In some Medieval tellings, the wolf became a werewolf, preserving the supernatural element. But the main character still was not called Red Riding Hood, for a very simple reason – she hadn't adopted her colorful wardrobe yet. Her red hood/ cape and her name were given to her in 1697 by French writer Charles Perrault, the first to publish the story in what was to become a very popular rendition. Perhaps even more popular was that published in Germany by the Brothers Grimm in 1812. Both Perrault and Grimm served it up as a moralistic fable about the dangers of listening to a smooth-talking stranger, and the importance of heeding the advice to "stay on the path" – a detail added by the Grimms. More traditional versions, however, were less preachy, and focused more on the girl's courage as she entered into maturity. In these versions, she escaped the danger on her own, without the help of a male rescuer – or alternatively, with the aid of women who were washing clothes at the river, over which they stretched a sheet she could use as a bridge; but when the wolf later tried the same thing, they let it go and he drowned. Still another variant has the wolf trying to eat Red, but his mouth is burned by the cape, which is enchanted. In those versions where she is rescued by a man, sometimes he is a Woodsman and sometimes he is a hunter who is already tracking the wolf. Sometimes he intervenes as the wolf is about to eat Red, and sometimes he rescues her from the wolf's stomach after he's already eaten her. Sometimes the Grandmother is also in that rather cramped wolf tummy, and sometimes she's merely been locked in the closet. The Act!vated version goes with the latter (less violent) treatment of Granny, and returns Red to her former self-reliance – with the support of the friendly Woodsman. Psychologists and literary scholars have long debated, discussed and analyzed the proper interpretation(s) of this tale. For one thing, it seems to be an allegory about conquering fear and danger (defeating the beast) while coming of age (traveling to Grandmother's place). But some also see it as possibly representing broader cycles in nature: the red hood may symbolize the sun, which is swallowed by night, and then reborn from its belly; or spring, which is similarly rescued from winter. Whatever meaning you choose to draw from it, it's undeniably one of the world's best-loved tales. It has inspired books, poems, plays, songs, paintings and films – many of which keep making it fresh and interesting. It's certain to continue entrancing children and adults everywhere for many generations to come. Woodsman: a person living or working in the woods, especially a forester, hunter, or woodcutter. Kilometer: a distance of a little over half a mile –3280 feet. 1. Because the wolf is a clever fellow who is out to trick Red, he speaks with a great many puns or words used deceptively. Even the name he gives for himself – Lou Pine – is a play on lupine, meaning wolf-like. How many other examples can you name? "Hood" refers to her hood, or the popular slang term for neighborhood. "Neck of the woods" is another popular expression, but he has his eye on her neck. "bilateral quadruped" is merely a scientific term for a four-legged animal; but the Wolf uses it in such as way as to suggest it's an expression of shock or sadness. "I was sleeping so I didn't know" is his attempt to cover up blurting out "I'm used to sleeping in the snow." 2. There are also certain popular expressions and figures of speech that are used in our production. The Woodsman, being a very straightforward and helpful fellow, tends to use figures of speech in a very literal manner. How many of these expressions can you recall from the show? Does Red wear a hood? A cape? A jacket? A cap? Something else? Does she meet a Woodsman? A hunter? A forest ranger? Somebody else? Does the wolf eat granny? Does he lock her in the closet? Does she run away? Does the wolf eat Red? Does she fight him off? Does he try to eat her, but get burned by an enchanted cape/hood/jacket, etc? Does the Woodsman/ hunter, etc. rescue her? Do women doing laundry at the river help defeat the wolf? Is the wolf killed? Is he merely frightened away? Does he apologize for his behavior and promise to be good? Is the wolf good or bad? Have the students come up with a list other examples of wolves in folktales. Are they good or bad? Most wolves have a bad reputation in folklore. Why is this? In nature are wolves bad? Wolves like all animals play an important role in the ecosystem. Wolves prey primarily on large ungulates, hoofed mammals such as deer, elk and moose. By preying on the most vulnerable (diseased, young, old, weak or injured) individuals, wolves help keep prey populations healthier and more vigorous. Predation by wolves also regulates ungulate distribution and group size, which impact overall native biodiversity. When deer and elk become too abundant for their habitat, for example, they overgraze vegetation, leading to habitat degradation and potentially damaging effects on other native wildlife. The story originally comes from France. Find France on the globe or Google Maps. Draw a map of the setting on paper or with chalk on the playground. Mark the spot where Red met the Woodsman and where she met the Wolf and (other animals). How do you get from Red Riding Hood's home to Grandma's house? Show two routes through the forest on your map. A short cut and a long winding path. Which one did the Wolf take? What did Red see along the path she took? Be sure to add Granny's address (398 Dewey Lane Apt #2). The wolf mask that you see on stage is made from fabric, felt and fun foam. The frame is made from plastic canvas (the kind that is commonly used for yarn projects) which has been cut into strips (about 3" wide). This photo lets you look inside to see how it is made. The mask is custom made to fit the actor. The artist began by wrapping strips of plastic canvas around the performer's head to form a base. Strips also went over the top to hold it in place. Then strips were added to form the shape of the wolf's head. Grey fabric was used to cover the frame work. The teeth are cut out of white fun foam and stitched into place. The artist used pictures of real wolves for reference but added eyes that are slightly askew and other touches to give the Wolf a comical, less intimidating appearance. Older students can experiment with making 3D animal masks like the one used in the show. Younger students can make masks using fun foam, paper plates or paper bags.